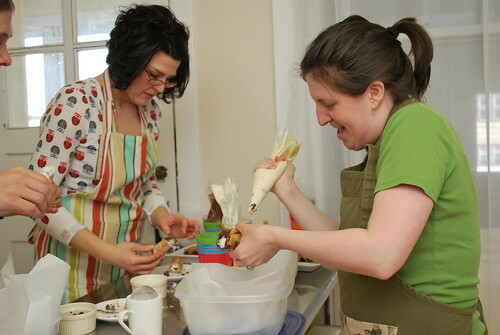 After making the dough for the cannoli shells, we focused on fillings. This filling was especially tasty because it was chockful of raisins and chopped chocolate. Making the filling entailed whipping heavy cream until it held soft peaks and folding in toasted pistachios, raisins and chocolate. The ricotta is then introduced and voila... the filling is ready! In a medium skillet over medium high heat, toast the unsalted pistachios until lightly browned. Remove from heat, cool and finely chop. Place chopped pistachios in a bowl. In the bowl of an electric mixer, whip the heavy cream with 1 tablespoon of sugar until it holds a soft peak. Fold in the raisins, 1/3 of the chopped chocolate, 1/3 of the chopped toasted pistachios and another 1 tablespoon of sugar. Gently fold the ricotta into the whipped cream mixture. When ready to serve, spoon the filling into a pastry bag fitted with a fat round tip. Fill the cannoli shells from each end. Blend the remaining chopped chocolate and pistachios on a plate. 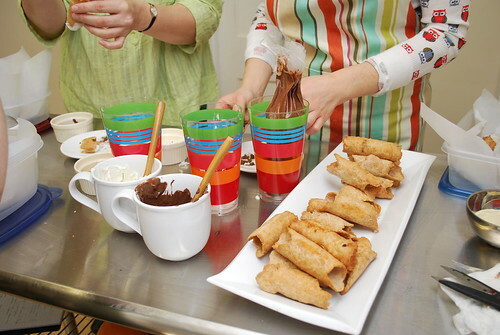 To garnish, dip each end of the cannoli into the chocolate pistachio mixture. 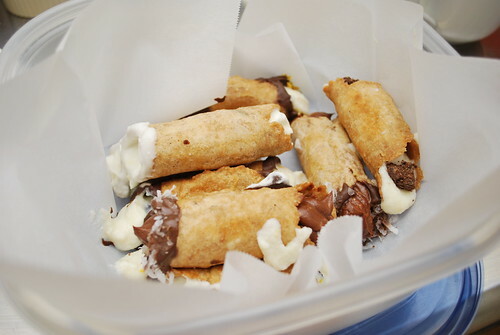 Cannoli can be filled and stored in the refrigerator no more than 1 hour ahead of time. Yum! 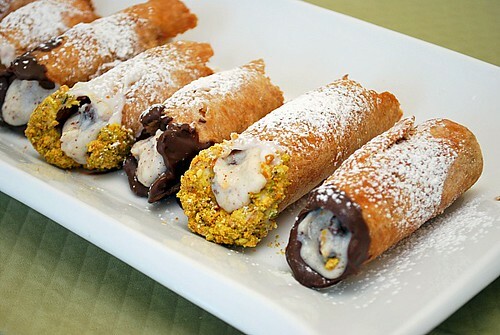 I have no idea why I haven't tried making Cannoli at home, but now I have too!